Well the glory days of my kids eating and enjoying everything placed before them have now officially ended. Gone are the days of three little boys sat at the dining table, each enjoying the same (lovingly prepared) meal as the next. No complaints, just thumbs up's all round and happy tummies afterwards. It all seems like a beautiful dream from another century. You see there once was a time when all three of mine simply enjoyed their meals. Then it happened, they got fussy. Fortunately we've hit upon some new faves that they all seem to enjoy. Naturally there were always some foodstuffs that just didn't go down well, tomatoes, salad, raw onion (in all it's forms), along with a few others, were just no go's. We didn't try to force them on the boys, and none of them would eat them. We still had healthy meals but certain food types would have been wasted, and we knew they'd probably come round to appreciating celery and peppers etc, in later life. Problem is though mealtimes suddenly became like a game of Russian Roulette with two out of three not liking x, whilst the 3rd one loves it. Tyne for example loves spaghetti, but not with sauce on it. Noah loves spag with the sauce but hates bits of tomato, and Sailors seems to dislike some pasta but loves others, bits of tomato, but loves the pepper and onion in the sauce with Quorn. Yeah personal taste in foods in kids can really be a minefield at times. Tyne-"Does this have tomato in it?" Me-"It's not pepper, it's 'Savoury Earth Apple'"
Noah-"I hate spugetti, I want my dessert." Sailor "I don't like it. Cake pleeeeeeeeaase." So if your little darlings suddenly become fussy or go off previous favourite meals there are some dishes out there to save the day and prevent early emotional breakdowns by parents. One of the 'new' faves for the boys are Air Fried Chicken Goujons. These are a really nice spin on the traditional favourites but are lower in fat, quick to prepare, and very, very tasty. We cook ours in our VonShef 3.5l Digital Air Fryer although a range of health fryers are also available by VonShef to suit individual tastes and needs. This means cooking time is reduced and there is only a tablespoon of oil used to coat the potatoes ideal for little tummies in a hurry, or parents who want to get there darlings fed and off to bed ASAP. The VonShef is a very compact and stylish alternative to many of the more expensive options available and is so simple to use. A simple 'one touch' button operating system with no dials, means the VonShef starts work straight away. Simply place the food in the generous 2.5l basket, select the required temperature (a guide is even shown on the buttons to make operating it even easier) and select the required time using the + or - buttons. As well as being simplicity itself to use, it also looks stylish with a black and brushed aluminium finish. In the past we'd been concerned about odours from fryers as neither Jon or I like the smell of fried food lingering around the house. Fortunately for us, the Digital Air Fryer really is odourless. It's also very compact for its capacity and sit's unobtrusively on our worktop whilst cooking away and is easy to store when not in use. With little hands often running in and out of the kitchen, normally when one of us is cooking, safety is a big concern. Whilst the VonShef and other cooking utensils are always placed out of reach, knowing the basket of the fryer has a cool touch handle and covered release button for the basket really brings peace of mind. This is the recipe I use but you can of course replace some ingredients with ones your little one(s) may prefer. 100g Bread crumbs (homemade or store bought it's up to you!). 2 tablespoons of finely chopped Parsley. 2 finely chopped Garlic Cloves or 3 tablespoons of Garlic Powder. 1 Tablespoon Paprika or Chili Powder if a spicier flavour is preferred. Green Beans and Corn on the Cob to serve on the side. Thoroughly whisk your egg in a small bowl. In another bowl mix bread crumbs, parsley, salt and pepper, with paprika/chili and garlic if desired. Add your vegetable oil to the breadcrumb and mix together until the contents of the bowl is loose and has a crumble like texture. Dip your mini-fillets in to the whisked egg being careful to remove any excess. Roll your egg coated mini-fillets in to the breadcrumb mix ensuring each fillet is evenly coated. Evenly place the crumbed fillets in your air fryer. You may have to check your own model for guide time and temperatures but approximately 12-15 minutes at 180 should do. Whilst the goujons are being air fried, placed your corn on the cob in a saucepan with boiling water for 8-10 minutes. Repeat the above process for your green beans or veg of choice (adjusting times to suit your veg!). 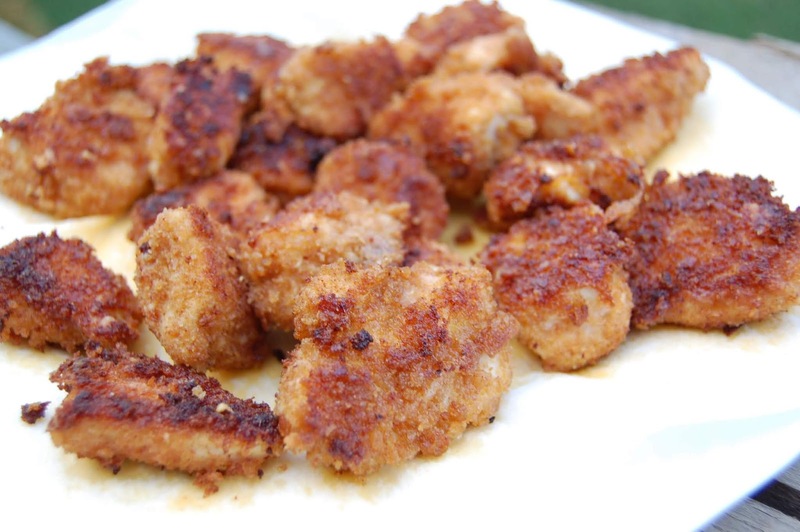 Upon being cooked your goujons should be crispy and not greasy, and no traces of pink should be visible in the centre of the chicken. Serve as a main meal with your green beans and corn on the cob, or with your favourite dipping sauces and baked potato and salad on the side. Yes it really is that simple, so apologies if the recipe seems a little obvious! Do you have any quick to prepare healthy meals your kids love? I'd love it if you could share them here or offer your tips for keeping kids happy at meals time whilst eating healthily!